Why? Just look at this lineup! Whoever decided to pair up Dear Rouge and Blonde Diamond (formerly Youngblood) is my new favourite person. Plus, Modern Space opening the show! Why? 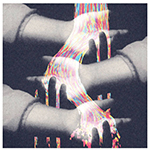 Another in the Blue Light Sessions at the Blue Light Studios in East Van, this time featuring local boys Leisure Club! Why? 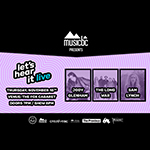 The 2nd instalment of “Let’s Hear It Live” put on by Music BC - and it’s only $5 in advance, so get your tickets ahead of time!